Earlier this week, planners from the Office of Transportation and Infrastructure Systems attended the Callowhill Neighbors Association meet at Azavea on Spring Garden Street to unveil a proposal to redesign the bike lanes on 10th and 13th Street from Vine to Spring Garden Streets. Both streets were early demonstration projects for buffered bike lanes in Center City in 2011. While the 13th Street design remained pretty much intact, bike lanes were replaced with sharrows on 10th St through the heart of Chinatown (Vine to Filbert St) due to opposition from community residents and business owners. The meeting handouts show that the proposal will move the 13th Street bike lane to the left side of the street (the 10th Street lane is already on the left, and will not be moved) with the addition of flex posts in the buffered areas, creating protected bike lanes where they are sorely needed. Tenth Street in this area of Center City sees 900 bicyclists per day, according to the OTIS handout, and this part of 13th Street sees 500 people on bicycles per day. OTIS is seeking letter of support from Callowhill Neighbors and Chinatown CDC for flipping bike lane/parking loading, eliminating some parking on 13th south of Spring Garden and eliminating parking on 10th Street, south of Spring Garden. In case this is not clear, the blocks mentioned here are the ones presented to these specific neighborhood organizations at this particular meeting and do not represent the entire project. Each neighborhood organization in the part of 10th and 13th Streets, between Spring Garden and South, that is part of the project is getting a meeting and being presented separately. 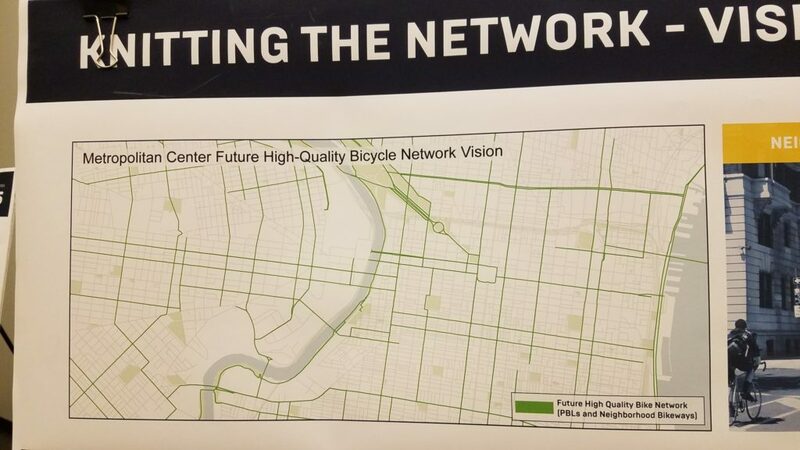 The project for protected bike lanes will go far beyond these two blocks and, perhaps most importantly, go through the 10th/13th business districts in Center City (Walnut/Sansom/Locust/etc). The city’s first presentations are about getting letters of support from these specific organizations by showing them where, in their neighborhoods, these will be going. The Bicycle Coalition is contacting our members and supporters who live in these neighborhoods to their neighborhood meetings to support these projects and make sure they are as high-quality as possible — and making sure their neighborhood organizations know they support this. If you live in the neighborhoods along 10th and 13th Streets in Center City, check out your neighborhood organization’s schedule.